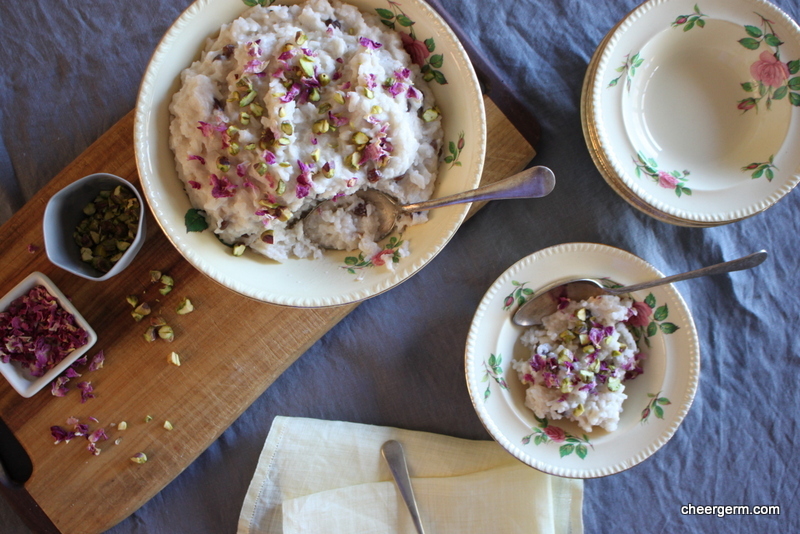 Rice pudding with cardamom, rosewater and pistachios. A faerie tale. 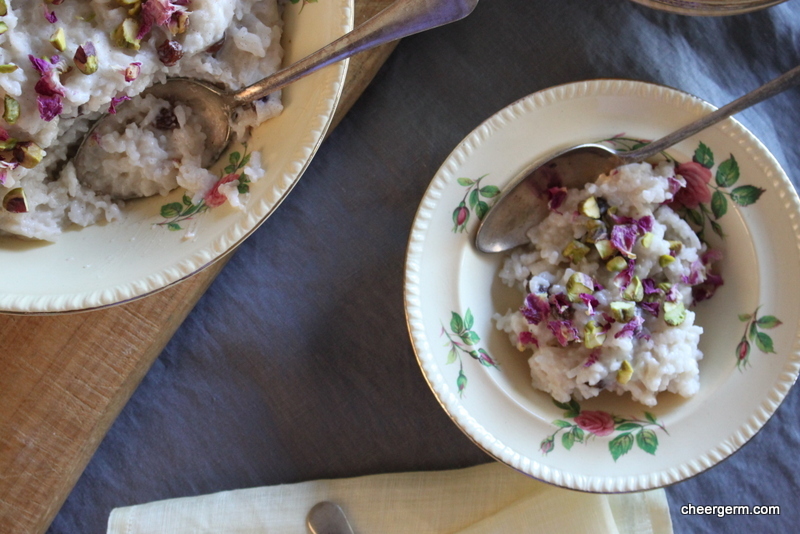 Once upon a time, a Cheergerm happened upon a magical sounding exotic rice pudding recipe in a magazine. It was torn out and safely filed/misplaced/lost, never to be seen again. (It is most likely in the same wee hidey-hole as my sanity and my mind.) As human beings are want to do, we hanker after something when it is gone. This dish was concocted from my standard rice pudding recipe and sketchy memory of the one that went missing. 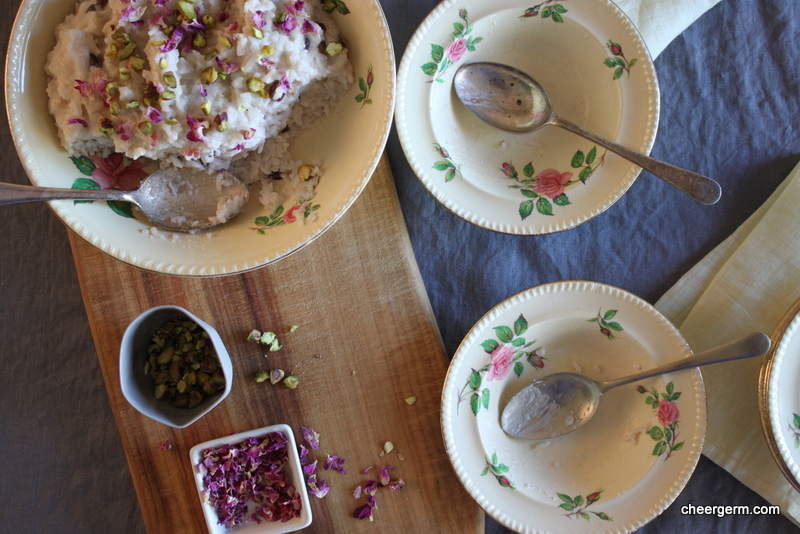 This dessert is decadent and creamy with a deep herbal spiciness from the cardamom and highlighted by the sweet floral aroma and flavour of the rose. The Yak and I lived happily ever after for about fifteen minutes whilst we hungrily devoured bowls of this delightful pudding. Now what else can I throw those bloody expensive rose petals over? The End. Place the rice, almond milk, 1/3 cup sugar, sultanas, cardamom and salt into a medium size saucepan. Stir and taste this mixture to see if you need to add more sugar. Bring the mixture to the boil then reduce to a simmer. Cook for 20 to 25 minutes, stirring occasionally, until it is thick and porridge-like. 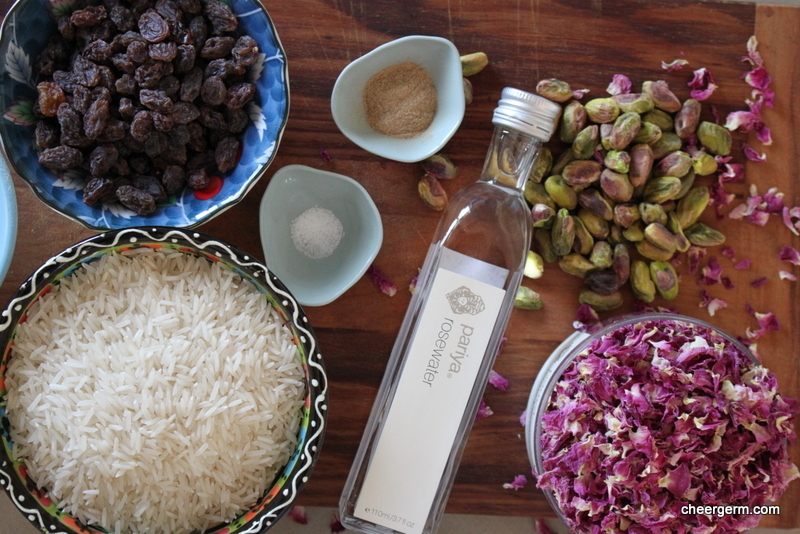 Remove from the heat and stir through the rosewater. 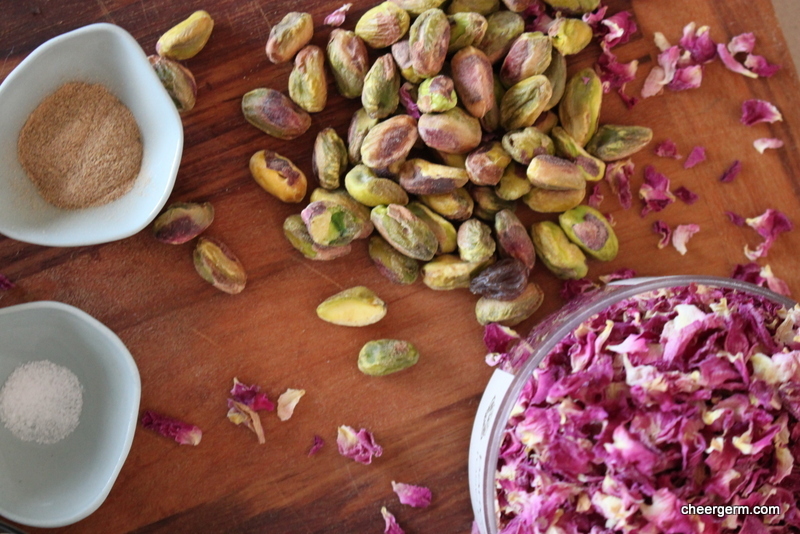 Serve and sprinkle with the chopped pistachios and dried rose petals. Oh, so very pretty. Note: one of these photos shows a brand name product, rest assured, no payment has been received for this post. Considering the cost, I wish! This also makes a great breakfast dish. 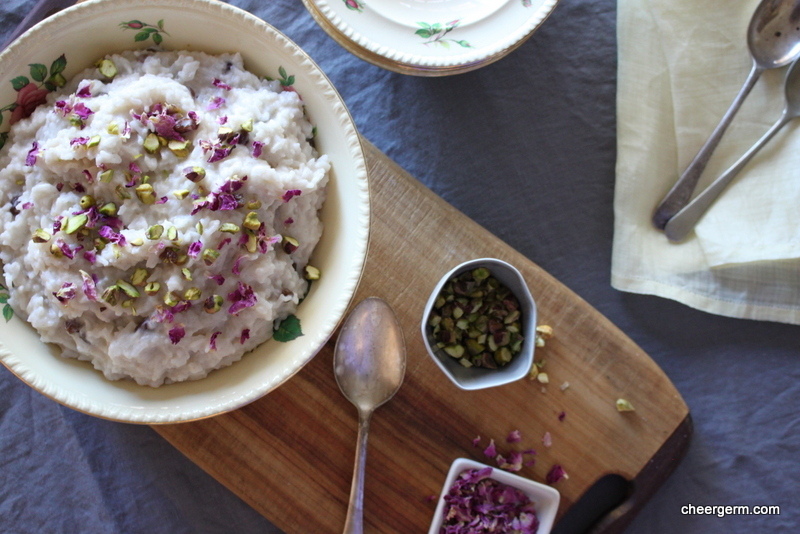 This entry was posted in Gluten free baking and desserts and tagged baking, cardamom, cheegerm, Cooking, dessert, food, gluten free, pistachios, rice pudding, rice pudding with cardamom rosewater and pistachios, rosewater. Bookmark the permalink. 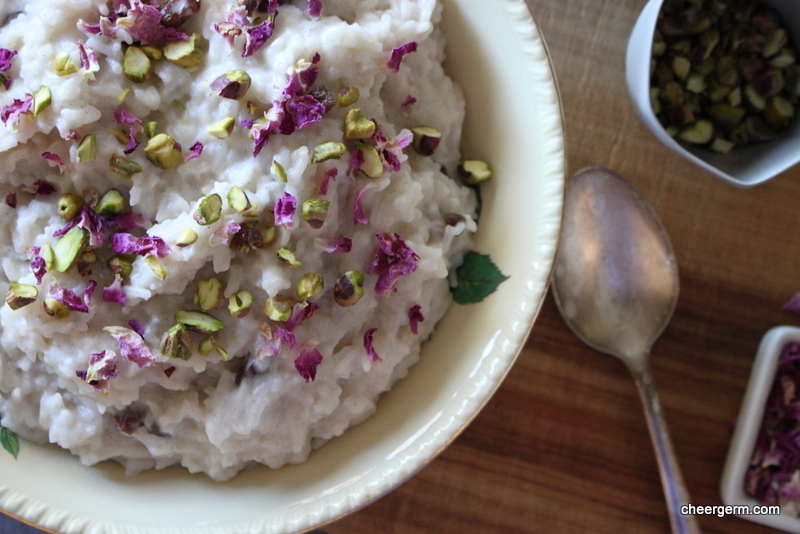 Really love the cardamom in your rice pudding. But, (sacrilege, I know) ditch the rose petals altogether. Or, since you’ve already done the deal with the fairies and have the petals, consider making your own supply of rose water. It is yum Kate! Yes, I did see some kheer recipes in my search. This has rosewater as well as the petals. So a bit of rose overkill…but hey, go big or go home…right? Ha ha…. It was always my favourite dessert in Indian restaurants back in the UK. If you think rose petals are swanky, there was one place in London that used to dust the top with flakes of edible gold. Waah! 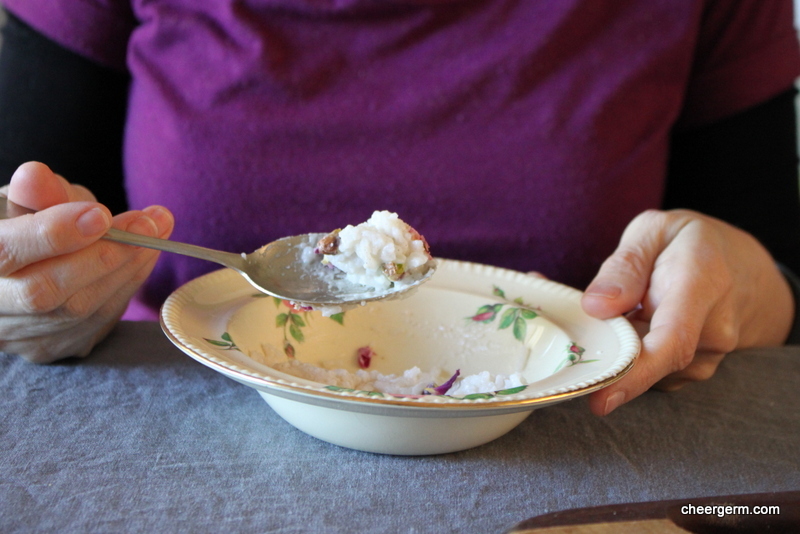 I read somewhere that in some exotic locations outside Oz, rose scented rice pudding is fed to new mothers post partum . It has a deep and mysterious exotic sense of luxurious elegance. Can the traded son have those qualities? I looooove rice pud. What a lovely idea to feed this to new mums of bubs. At that thought, I do feel a tad regretful at my trade but then I remember a particular look he gave me earlier today and I am all good again. I went on a rice pudding bender a few years ago then pulled back but I feel the siren call once more. Good stuff hey. The green of the pistachios with the pink of the rose petals is exquisite! Especially on your matching china 🙂 I am a big rice pudding fan, but we made it differently when I was a girl. It was more like a custard with rice in, and had nutmeg sprinkled on top. Thanks LM, so pretty hey? 😊 The rose China was another op shop find and I couldn’t resist using it for this post. I have made rice pudding in the oven but not for ages. I’m a sucker for china with flowers on it, especially roses! 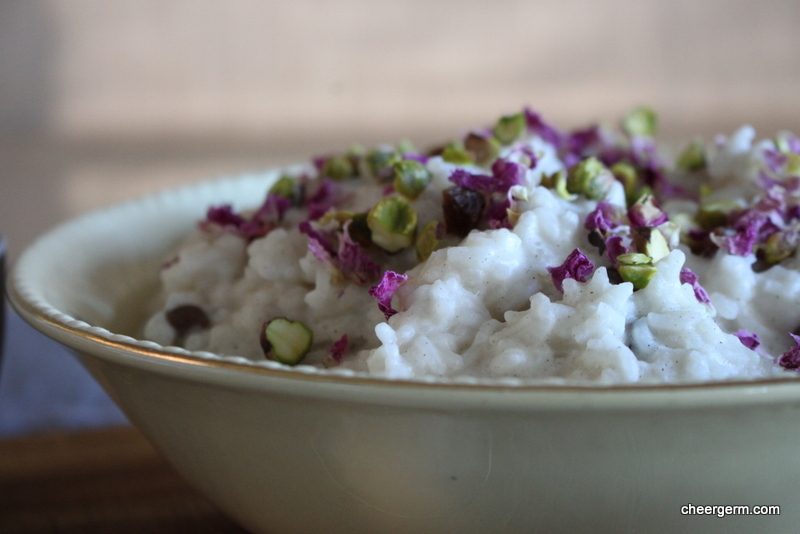 That is by far the prettiest rice pudding I’ve ever seen. 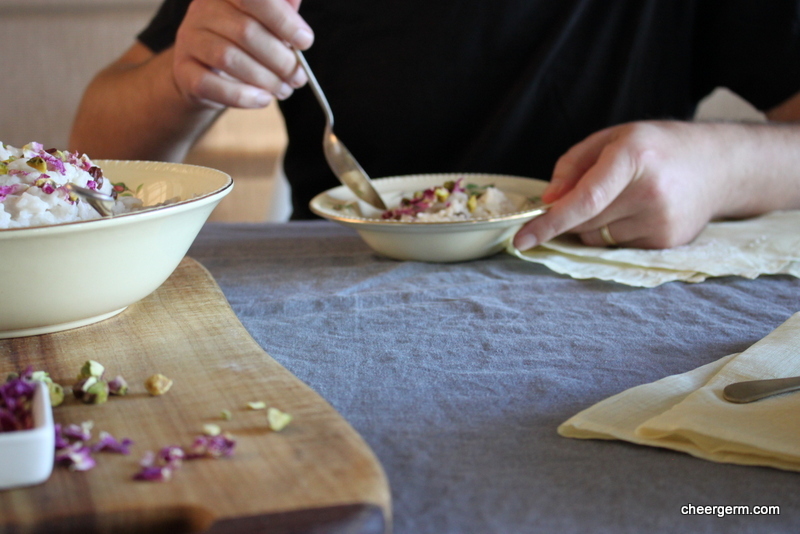 And where did you find the perfect bowls to match? Is Almond milk hard to fin in Australia? IT is as common as dirt in our city, where you can find it sweetened, unsweetened, chocolate, vanilla, organic, etc. It is by far my favourite alt-milk beverage. As for the rose petals, who knew they were so dear? It makes you want to take up rose farming. Thanks Sue, the bowls were an op shop (charity shop) find and I just had to use them for this post! It’s not hard to find almond milk but the unsweetened kind isn’t quite as common. I have used sweetened organic almond milk before (it had agave) and had to add less sugar. The rose petals were about $15 aussie dollars and whilst I would spend that on olive oil or even wine (and more!) in a heartbeat, it felt indulgent and fanciful to spend it on rose petals. Maybe rose petal farming is the future? Wouldn’t it be a dream job to be a rose farmer? Although you’d need a special suit to harvest them to avoid the thorns. Lovely little Indian thing, and beautiful photos. Rose petal touch is lovely- I’m expecting to see your remaining petals turn up on little meringues or sprinkled over something middle eastern. When my DIL drop off the two boys, she says she’ll pick them up when they turn 18. Silly girl- that;s when they become a real worry. Boys don’t grow up until they are at least 35. Thanks Francesca, they were a fun bunch of photos to take. Yes, they will be verily sprinkled atop of many a thing! Ha! He has just been a tad ‘pre-teen’ and argumentative the last few days. Yes, I think 18 and driving will be more of a worry!! Eek! Don’t you know that if you’d hung on a couple of years you’d be able to have civilised conversations with your boy? A magic sort of something happens when they turn eighteen. They begin reverting to what the were before testosterone kicked in. Is it too late to get him back? Thanks so much Fi! Maybe you need to add some rose petals to those olive trees? I’ve been making olive leaf tea recently and some rose petals would certainly make that prettier! I love cardamom in so many different recipes, but this combination sounds like the best, most aromatic dessert ever! Thanks MF, cardamom is a great little spice hey?